Tourists look around at a tourist attraction in Sanya, south China’s Hainan Province, Jan. 14, 2011. 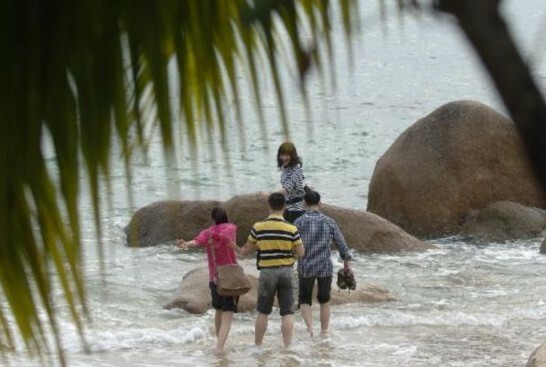 According to the latest statistics recently issued by the local authority, the tourists to Sanya has totaled 7.88 million by the end of November, 2010, rising 16 percent year on year. Meanwhile the revenue of tourism in the 11 months reached 11.89 billion RMB (around 1.79 billion USD), 16.4 percent more than the same period of last year. Sanya is the southernmost city of China, located on a latitude of 18°N. Endowed with sunshine, sea, beach, fresh air, forest, hot spring and tropical scenery, Sanya owns the best tourism industry in Hainan. Since the General Office of the State Council promulgated its "Opinions on Promoting the Construction and Development of Hainan International Tourism Island" on December 31, 2009, Sanya has met its best opportunity of development. The opinion set the goal that by 2020, the tourism service facilities, management, and service levels of Hainan Island will meet international tourism service standards, making Hainan a world-renowned island recreation and vacation resort. On June 8, 2010, National Development and Reform Commission officially approved the "Hainan International Tourism Island Construction and Development Plan", according to which Hainan will be divided into six functional areas-North, South, Central, East, West and Marine. The south area will include Lingshui, Baoting, and Ledong counties with Sanya as the center, a total of 6,955 square kilometers, accounting for 20.41% of Hainan Island’s total area. Besides the massive construction on infrastructure and tourism facilities, the city also works hard on improving management on tourism, such as cracking down ripoff of customers at some ill-formed restaurants and unreasonably high hotel prices to develop in a fast and heathy way.